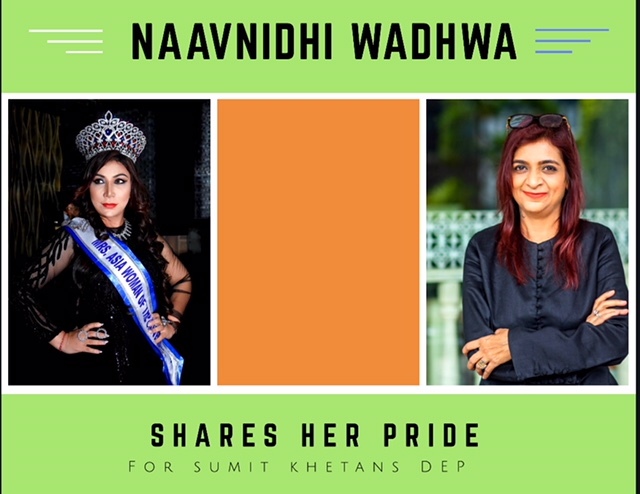 Naavnidhi k Wadhwa - Mrs Asia woman of universe 2018 gives a message to the youth Navnidhi Wadhwa, is an optimistic and vibrant life-coach. She was crowned Mrs. Asia Women of Universe, 2018 and has multiple talents and achievements which include an award as spiritual life coach, spiritual diva in holistic healing and wellness coach. She also won the prestigious Navratna award for graphologidivast. She is passionate about children and wants to empower them . I love to unearth the insightful stories of awe-inspiring individuals, discover and reveal their potential through my YouTube Channel. I take pride in introducing you to one more of such a persona. I was invited to an event organized by the renowned choreographer, Sumit Khetan at Aksa Beach on the occasion of the 72ndIndependence Day where he expressed his gratitude to the nation through the art form – dance. His team members who were trained under a special Dance Education Program (DEP) were a bunch of highly ambitious and talented children from different states of India. These were the underprivileged youth, who under the generous guidance of Sumit Khetan could perform a dance in various specialized forms. While being trained Mr. Khetan had also provided a home for them to stay in and had given them an opportunity to work with celebrities and getting dance training from international trainers. They were also taught to speak the global language, English in its basic form so that they could be a part of the larger world in Bollywood and elsewhere. This humble choreographer and a humanitarian chose to pay tribute to the jawans on this special day through the dance performance. A few celebrities came to support his mission and one of them who made a significant difference to the cause was Navnidhi Wadhwa. Navnidhi Wadhwa is an optimistic and vibrant life-coach. She was crowned Mrs. Asia Women of Universe, 2018 and has multiple talents and achievements which include an award as a spiritual life coach, a spiritual diva in holistic healing and wellness coach. She also won the prestigious Navratna award for graphologist. She truly believes that it’s a great feeling when we make a difference in someone’s life through our good work. She also believes in living the moment and adding happiness in the lives of people around. In her opinion, living in awareness is more important than being judgmental. The one common thing between us is the idea of making the children’s life more secured and beautiful by helping them with self-belief and encouraging them to uncover their self-potential. While speaking during the event, she said that she connects children and plants together. They are equally important to her as planting trees makes the planet beautiful and nurturing children makes the world beautiful. With this thought on her mind, she was honored and privileged to be at the site of the shoot with Sumit Khetan. She congratulates him for performing for a noble cause. As a spiritual healer and also a Vastu Consultant, Navnidhi says she believes that meditation is not only closing eyes and sitting at one place but being creative and that’s why the form of art such as dance is meditation. During the dance, you tend to let go of many blockages and this leads to a prosperous life which can be lived without any bandage. She tells the youth of India to free themselves from beliefs of others and to be more open-minded. This beautiful lady thinks that true beauty is when we have humanity and we accept the people around us with an open heart and accept them the way they are. Counting blessings rather than worries is a better way of living. She also advises that we should learn from our mistakes, be focused and strive for one’s betterment. She has expressed her concerns of insecurity of women and an increasing number of rapes. She also wants to prove the people wrong who think that word beauty and spirituality doesn’t go together. She wants to help the society in a much bigger way. The event was conceptualised and organised by bubble communication- a marketing Communication Company by Aarti Notiyal- a former Producer and Journalist and Award Winning Marketing professional. Bubble resonates with the thoughts and emotions of all celebrities as above and organises events with kids on an annual basis as part of its CSR initiative. Meghdeep Bose shares his joy of being part Sumit Khetan s DEP program Meghdeep Bose is an amazingly talented artist and he supported these children as he could relate well to them. He has given the industry very beautiful and popular songs like “Swag Se Swagat’ (Tiger Zinda Hai, 2017), “Bol Do Na Zara” (Azhar, 2016), “Jab Tak” (M.S. Dhoni, 2016) and many more. His recent work includes Bharat, Student Of The Year 2, Eela and a lot more. Here are a few amazing insighs about his beliefs on growth and success. Hi, This is Gemini Dhar, a “Take Charge Expert”, an Author of fast selling book 9 ways to empower and I Empower women and children with a mindset of I CAN. I have been an entrepreneur for 27 years and As You Tuber, I share stories that inspire my audience and subscribers. Meghdeep Bose who is a brilliant music composer, producer, arranger, and singer. His remarkable presence at the Aksa Beach on the 72nd Independence Day made a huge difference to Sumit Khetan’s dance troop. Mr. Khetan, a choreographer and a humanitarian, had gathered his special team of underprivileged students from all over the country. This team had been trained under the Dance Education Program (DEP). The bighearted man, Sumit Khetan provided a yearlong training to these children with the help of international dance instructors. He also helped the children with a free stay throughout the training and also offered a course on English speaking just to ensure that these kids are well groomed and are ready in all ways of performance in Bollywood and other places. Mr. Khetan chose this Independence Day to express his patriotism through dance performed by these children. Meghdeep Bose is an amazingly talented artist and he supported these children as he could relate well to them. He didn’t have a godfather in his life to bring him to this level and that’s why he could place himself in the shoes of these underprivileged yet such talented children. As a person, he is very emotionally involved in his work but says that commercial success of the songs has never been his agenda, and he only wants to focus on making every song different from his previous ones. He has given the industry very beautiful and popular songs like “Swag Se Swagat’ (Tiger Zinda Hai, 2017), “Bol Do Na Zara” (Azhar, 2016), “Jab Tak” (M.S. Dhoni, 2016) and many more. His recent work includes Bharat, Student Of The Year 2, Eela and a lot more. The super talented music producer has been honored with Music Composer of the year award by the Indian Recording Arts Academy (IRAA) awards. He also won awards for “Noor” song “Uff Ye Noor” and non-film album “Tagore For Today” song “Tomar Holo Shuru”. These awards were a result of his true dedication and deep love of music. He wouldn’t even take an off on special days like birthday, Durgapooja or Diwali. As he has grown up watching big talents in this industry working hard and so he also immersed himself into his work with great passion. During my interview with him, he thoughtfully mentioned that what needs to be applied in life is not just talent but also wisdom where to work and how much to work. When I asked him about his opinion on failure and how to face it, he said amidst all failures is a success. He said we must have faith. From his personal experience, he conveyed that when you know what the right thing is, then believe in yourself. You can’t be anyone else. Throughout my talk with him, I could easily connect with him as we have this beautiful thing in common. I, as a, "Take Charge Expert” have worked with many women and children and helped them build their self-belief. I also inspire them by assuring them of the power belief of “I can”. At the same time, Mr. Bose also thinks on the similar wavelength. The event was conceptualized and organized by bubble communication- marketing Communication Company by Aarti Notiyal - a former Producer and Journalist and Award Winning Marketing professional. Bubble resonates with the thoughts and emotions of all celebrities as above and organizes events with kids on an annual basis as part of its CSR initiative. Celebrity singer Brijesh Shandilya with Gemini Dhar Brijesh Shandilya. Brijesh, also known as “The Melody Man”, is a fabulous musician whose music covers genres like new-age Indian classical music and Bollywood music. He has won awards like Gima Awards, Radio Mirchi awards in 2015. He is well-known for his songs such as “Mast Kalandar”, Banno”, “ Mera Nachan Nu”, “ Golmaal (Title Track)” and has given many more chartbuster music numbers in the industry. He has also worked for movies like Oye Lucky! Lucky Oye!, Tanu Weds Manu returns, Golmaal Again, Airlift and many more in the list. Brijesh Shandilya supports empowerment passion with Gemini Dhar. Hi, This is Gemini Dhar, a “Take Charge Expert”, an Author of fast selling book 9 ways to empower and I Empower women and children with a mindset of I CAN. I have been an entrepreneur for 27 years and As You Tuber I share stories that inspire my audience and subscribers. Brijesh Shandilya is one such amazing personality whom I met at Sumit Khetan’s shoot of his video for the 72nd Independence Day. On the event of the most celebrated national day, Sumit Khetan displayed his patriotic emotions through dance performance by his special team of young and talented dancers coming from all parts of our country. He runs an extra ordinary “Dance Education Program” under which the underprivileged children are trained by international dance instructors. They are provided free stay throughout the one-year program and given opportunities to work with the great faces in the Bollywood industries. He choose the 72nd Independence Day to reveal the elegance of these children through their dance performance and pay a tribute to the brave-hearted people who struggled for our freedom. This event was graced by the presence and support of a few kind-hearted celebrities. One such amazing person present there was Brijesh Shandilya. Brijesh, also known as “The Melody Man”, is a fabulous musician whose music covers genres like new-age Indian classical music and Bollywood music. He has won awards like Gima Awards, Radio Mirchi awards in 2015. He is well-known for his songs such as “Mast Kalandar”, Banno”, “ Mera Nachan Nu”, “ Golmaal (Title Track)” and has given many more chartbuster music numbers in the industry. He has also worked for movies like Oye Lucky! Lucky Oye!, Tanu Weds Manu returns, Golmaal Again, Airlift and many more in the list. The highly talented singer comes from a small town in Uttar Pradesh and chased his dreams of showcasing his talent to the music industry and thus landed in Mumbai. He tried his luck in many reality shows but was unfortunately eliminated in the initial rounds. As that didn’t work for him well, he started singing in restaurants and finally got an opportunity to sing in a studio. He got his first break in “Oye Lucky! Lucky Oye!” in 2008. However, the song “Banno” changed his life and started shaping up his career for him. From then on, he never had to look back and only kept climbing higher on the staircase to success. He has come a long way through many hardships and struggle in this dynamic music industry. He is truly a blessing to this industry and keeps working harder with time and now he admits that he has more sense of emotionally connecting with his music. This makes his work reach the audience and touches their hearts and in return, he receives abundant love and support from his listeners. He speaks very high about Sumit Khetan and says that they have known each other for a very long time now. They have seen each other grow and he really appreciates the virtuous thoughts and intentions, which Sumit holds, in his heart for the society. He thinks that Sumit is returning to the society in a very good way. He said he was there to support this very cause as Sumit has come a long way and is doing a fantastic job by training these children too. Through this interview, he wants to convey the message to the youth that they should feel lucky to be a part of this generation as there are many people around to support them. If they speak to people and show them their talent, it is heard and seen and valued by many. To know more and to listen to his melodious voice, watch the man himself. Hi, this is Gemini Dhar, A Take Charge Expert and Author. Today I'm writing about a topic that is really close to my heart I've had the pleasure of knowing many wonderful souls and they are today, entitled, to enjoy their lives, with freedom and joy. How much ever difficult you feel something is, how much ever impossible something that you can visualize something that is completely bizarre and not practical and full of challenges and something which really really is a big big big roadblock in your life can be effortlessly overcome with persistence and being at it. Of course you need to put in the hard work, you need to put in the hours, you need to put in the knowledge, you need to put in the skills, you need to get support, you need to create a movement where you want a decision which is contradictory to the thought process of normal human beings. I’m saying normal human beings is because I feel each person has the potential to become extraordinary and live an extraordinary life being in an ordinary circumstance but creating an extraordinary outcome is what I really want people to work on and that is what I have done in my life. I am really happy to share the joy of hearing the new judgment by the Supreme Court. The LGBTQ community, I would not call them somebody different; I would call them humans with a different choice. They made a different choice, they choose their gender, they decide who they want to be, and they decide who is going to be their life partner. So they have the power to decide within them. However the society does not like anything which is different, unusual, which does not fit into their category or something which they have never been exposed to is new, like you try a new phone you are really thinking is it going to be good, will I get the same comfort as my earlier phone, will this phone be made from this and that, There are millions of doubts that we have when we start something new or take in a new concept. Also, the things that we don’t know are alien to us. Like anybody coming from space to our planet is an alien and we treat them different, we would like to research on him, we would like to not accept him immediately, because we want to first check out whether it's going to be dangerous to us or will it bring in something which we are not used to or something we don’t necessarily enjoy/like. This is exactly the mindset which each person goes through when he comes across something which he does not like or does not know or does not want to share with the world, so we keep in so many secrets in our hearts just for the fear of judgment we don’t want to show a face that has no makeup because we will be judged by the by the way our skin looks, we would not want to wear a particular kind of outfit in front of our parents, so and so. We even have boundaries across the globe for allowing different culture to come into our land. At times, we go on vacation and try out new looks and new things so that people around us are not directly aware of what we do, it gives a feeling of immense satisfaction and freedom. Due to social media, life has become very transparent, and at the same time...a bit fake. however, it depends on us, how we are going to Take Charge of Our Own Lives so this huge huge, huge mind transforming judgement about 377 is the beginning of a massive change in Indian judicial system and will break through the taboos created around the LGBTQ community. This brings a sigh of relief to many of my friends and acquaintance who had to unfortunately keep themselves undercover for the fear of society and now, they shall have the courage to choose and declare to the society whoever they wish to be known as finally Indian Law accepts them the way they are and this is something every human being should be allowed just because I’m cisgender or heterosexual, it does not give me the authorities to judge your growth success and happiness based on your orientation or gender. In the first chapter of my book, 9 ways to empower, I strongly say that men and women are not equal,and before you start throwing bricks at me, you need to read the story of Honey Lulla and see how I percieve difference. and believe to understand my perception you need to read about Honey Lulla and many other women whose stories will change the perception of the way you look at life. Why changing your perception is important because your belief in yourself and being able to express your inner fears need to be expressed the moment you accept yourself you will admire and create your own self-worth which is the core of valuing yourself giving you confidence at times. I have had the pleasure of knowing Vicky Shinde who has lived through many horrifying incidents but she did not give up. In fact, she put in her best to fight against the stigma and stand up for her rights. Vicky has been a wonderful strong human being who has been part of this moment for many years whichever gender we choose to be or to love, it is more important to see that we do not create a roadblock in any other human beings lives, an empowered human will always support people in need and find ways to contribute towards their happiness. And we should continue to support and help bring progress into the lives of the LGBTQ community, because no matter who does it, or who it is for, love is love . The most incredible feeling is to love and to be loved.